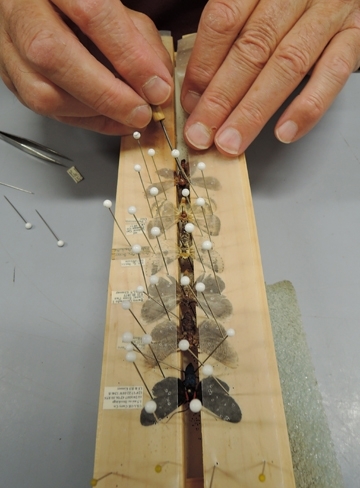 Entomologist Jeff Smith knows how to spread his wings--and that of butterflies and moths, too. Usually “spreading one's wings” means leaving, but for Smith--a retired businessman, a 27-year volunteer at the Bohart Museum of Entomology, University of California, Davis, and a U.S. Air Force veteran--“spreading wings” means staying and doing what he loves. 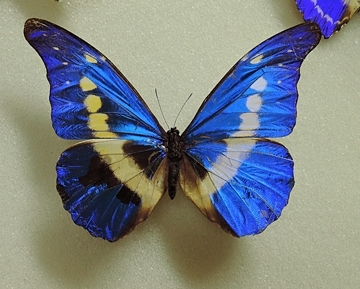 Smith curates the 400,000-specimen Lepidoptera collection at the Bohart Museum, a world-renowned insect museum that houses a global collection of nearly 8 million specimens. Smith organizes and identifies the butterflies and moths, creates the drawers that display them, and the labels that identify them. In between, he shares his passion for insects and spiders at outreach programs. The entomologist has spread the wings of 200,000 butterflies and moths, or about 7000 a year, since 1988. 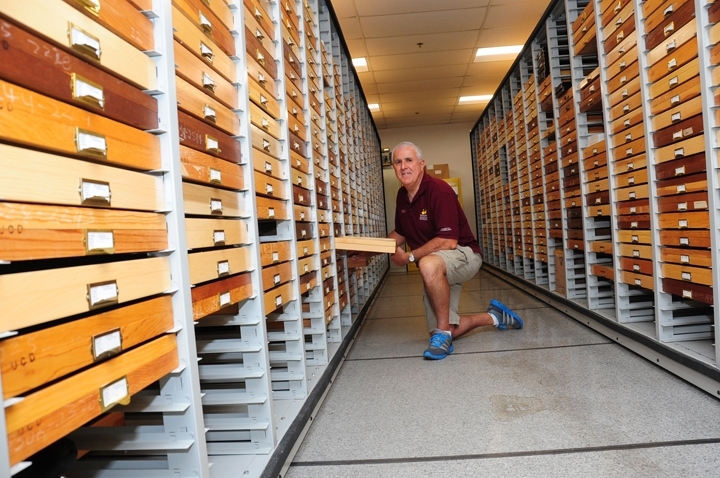 “I do most of the work at my home (Rocklin), where I spread and identify specimens and add them to the museum collection,” he said. “My life is dedicated to this passion of entomology,” said Smith, an associate of the Bohart Museum and a member of the Bohart Museum Society and the Lepidopterists' Society. “Entomology is my passion and the Bohart Museum is my cause.” He retired in 2013 from a 35-year career with Univar Environmental Science but that just means he can spend more time at the insect museum. If anyone were to put a monetary value on Jeff Smith's museum donations, it would exceed $160,000, said Kimsey, calculating that the 200,000 curated butterflies and moths alone translates into 33,000 hours of work. A philanthropist extraordinaire, Smith has donated more than 35,000 specimens from his own collection; gifted more than 6000 foam-bottomed unit boxes, 5000 pins and seven reams of label paper; and crafted more than 2000 glass-topped specimen drawers to the Bohart Museum. He loves doing outreach programs, including classroom visits, Bohart open houses, state and county fairs, festivals, school science events, UC Davis Picnic Day and other educational opportunities. He engages crowds with specimens, but also with the permanent residents of the Bohart's live “Petting Zoo.” It was Smith who donated the crowd favorite, Rosie the Tarantula, who lived to 24 years. Some of the work he does: Smith curates thousands of moths and butterflies given him by UC Davis scientists visiting various locations, including Arizona (Bohart senior museum scientist Steve Heydon), Belize (UC Davis-doctorate entomologist Fran Keller; Arizona, Texas and North Dakota (Andy Engelis, curator of the UC Davis Museum of Wildlife and Fish Biology) and the ongoing Bohart research led by Lynn Kimsey at the Algodones Dunes in Imperial County. Smith has spread thousands of micro-lepidoptera for the Dunes project. 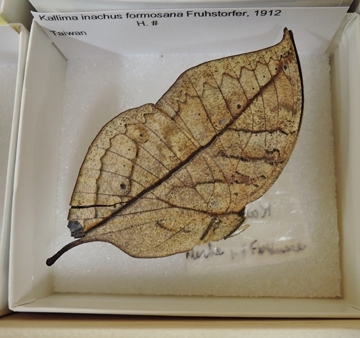 In 2000, a scientific team led by Heydon returned from Papua New Guinea with a vast amount of specimens, and over the next two years Smith spread around 18,000 moths and butterflies, all now incorporated into the Bohart collection. The largest moth he's spread? The Atlas moth, which has a 12-inch wingspan. "Personally, I am astounded by the thousands upon thousands of butterflies and moths that leff has prepared for display or scientific study," said research entomologist Tom Zavorink, a Bohart Museum associate. 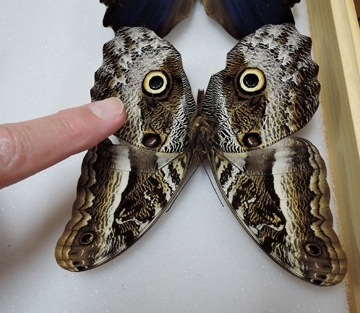 "This is no small task because butterfly and moth specimens are usually brought from the field in envelopes or boxes with their wings folded over their backs or around their bodies, and preparing them for display or scientific study involves relaxing them in a humid chamber so their wings and legs can be manipulated, carefully spreading open the wings, positioning them on a flat surface, and securing them in that position until the specimen dries again. 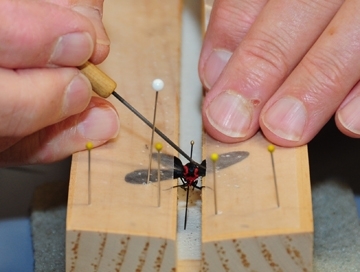 This is an onerous task that many entomologists, myself included, shun because we don't have the time, manual dexterity, or patience it takes to prepare quality specimens." Smith worked at the Bohart on vacations, evenings and weekends while working full-time at Univar, a major product supplier to the professional pest management industries. “As a salesman of 23 years and then resource development with our website until I retired, I had the chance to teach our customers how to do pest control properly,” Smith related. “I taught probably thousands of classes on safe and effective use of pesticides, personal safety, pest identification and biology, etc., and like to think I made an impact on increasing the professionalism of this industry.” A frequent speaker at industry conferences, Smith was often the “go to” person for insect identification and technical questions. Smith credits his parents with sparking his interest in insects. 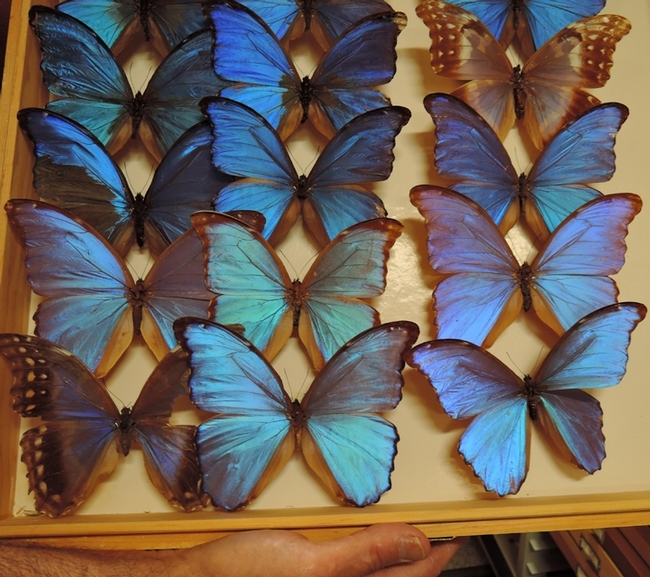 As a child growing up in Campbell, Calif., he collected butterflies, moths and other insects. “My parents loved the outdoors and taught us to be curious,” he said. His father, Al, now deceased, was a general contractor, and his mother, Alice, now 98, worked in the business. Jeff Smith holds two bachelor's degrees from San Jose State University: one in biology and one in environmental health, both with concentrations in entomology. In between degrees, he served four years in the Air Force as a ground crew chief on B-52s and KC-135s. The Air Force awarded him the master crew chief certificate earlier than other crew members. “I am particularly proud of that: I worked hard, and took my job seriously,” said Smith, who saw duty in Thailand and Guam. It was at his home base in Riverside that he would meet his wife-to-be, Cathy, also in the U. S. Air Force. From his father he learned woodworking. Of the some 2000 drawers he has made for the Bohart Museum “about half are from scratch,” he said. They include 150 drawers from recycled redwood decking and fencing. He makes and donates spreading boards for open houses and for UC Davis Entomology Club clinics. Jeff Smith is doing all three. "We really don't know what we would do without Jeff Smith," Kimsey said. 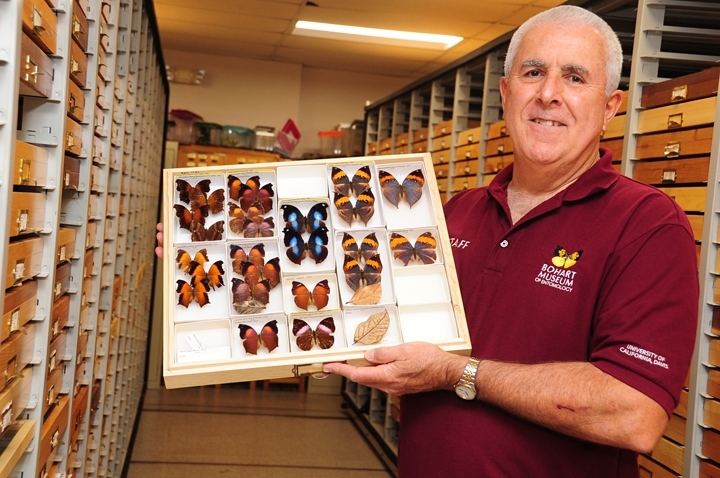 Jeff Smith holds a drawer from the Lepidoptera collection. These colorful butterflies draw a lot of attention at the Bohart Museum of Entomology.They are South American morpho butterflies, Morpho menelaus.